On this day in history, 18th October 1541, Margaret Tudor died of a stroke at Methven Castle, Perthshire, Scotland. She was laid to rest at the Carthusian Priory of St John in Perth, which was later destroyed. 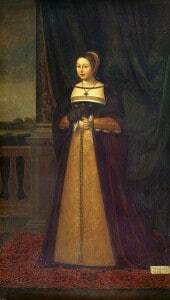 Margaret Tudor was born on the 28th November 1489. She was the eldest surviving daughter of Henry VII and Elizabeth of York, and was the sister of Henry VIII. After lengthy negotiations, Margaret was promised in marriage to James IV of Scotland in the Treaty of Perpetual Peace between England and Scotland on the 24th January 1502. The couple were married by proxy and in 1503 Margaret travelled to Scotland, stopping at various places, including York, on the way. James and Margaret married properly at Holyrood Abbey, Edinburgh, on the 8th August, and poet William Dunbar wrote of the occasion in his poem “The Thistle and the Rose”. James IV and Margaret Tudor went on to have six children, including the future James V of Scotland, father of Mary Queen of Scots. James died at the Battle of Flodden in 1513, a battle between Scotland and Margaret’s brother’s forces. For a time, Margaret acted as Regent and although she had opposition, being the enemy’s sister, she managed to reconcile Scotland and England. On the 6th August 1514 Margaret secretly married Archibald Douglas, 6th Earl of Angus, a member of the powerful Scottish House of Douglas. When news of the marriage got out, it was opposed by the nobles and in September 1514 the Privy Council ruled that she had acted against the terms of James IV’s will and could no longer act as Regent. She was replaced by John Stewart, 2nd Duke of Albany, who took custody of her sons, James and Alexander. In 1515, Margaret and her husband fled across the border and was taken to Harbottle Castle by Lord Dacre, Warden of the Marches. There, on 8th October 1515, she gave birth to a daughter, Lady Margaret Douglas, the future mother of Henry Stuart, Lord Darnley. A couple of months later, Margaret received news that her son, Alexander, had died at Stirling Castle. It was also around this time that Margaret’s husband, Angus, abandoned his wife to return to Scotland and make peace with Albany and escape a charge of treason. Margaret, on the other hand, continued her journey on to London where her brother, Henry VIII, arranged lodgings for her at Scotland Yard in Whitehall. After a treaty was negotiated between Albany, Cardinal Wolsey and Henry VIII, Margaret returned to Scotland in 1517, only to find out that her husband had been living with Lady Jane Stewart in her absence. Margaret decided that she wanted a divorce and sought her brother’s help. However, Henry VIII did not believe in divorce (at this time anyway!) and was also unwilling to make an enemy of his brother-in-law. Margaret carried on fighting for her divorce, even enlisting the help of Albany, who even spread rumours that he and Margaret were lovers. In March 1527, Albany finally convinced Pope Clement VII to grant Margaret’s petition and Margaret went on to marry Henry Stewart, 1st Lord Methven, on 3rd March 1528. However, the marriage was not happy for long. Margaret had managed to pick another unfaithful husband, so she again fought for a divorce, although this was not supported by her son, King James V. Margaret was later able to reconcile with Methven. On the 12th June 1538, Margaret’s son, James V, married Mary of Guise by proxy, and when Mary arrived in Scotland she became good friends with her mother-in-law. Margaret died on the 18th October 1541 and it was to her great-grandson, King James VI of Scotland, that the Tudor crown passed on the death of her niece, Elizabeth I, in 1603. On the 24th March 1603, James VI became King James I, uniting Scotland and England, and beginning a new dynasty, the House of Stuart. I may descend from her! @ Angelina Boleyn – I think it’s really neat that you might be able to trace your ancestry to Margaret Tudor. My grandmother died before I was able to get the full story, which is the archives of Tulane University (New Orleans), but somehow we descend from Eleanore of Acquitaine…. which means I might be related some way to Anne Boleyn. I’m a descendant of Louis VI of France and somehow I think it’s all tied in. The connection would be on Anne’s father’s side. So Margaret’s resting place was destroyed? Was her body lost? How and when was it destroyed? Thanks for another wonderful article. I truly enjoy reading the Anne Boleyn Files. Interesting about ancestors. My ancestors descended from Sir John Shelton, married to Lady Anne (Boleyn) Shelton, sister to Thomas Boleyn. Their daughter, Margaret, Pretty Madge, was one of Henry VIII’s lovers (don’t know if it was ever really consumated) My novel, AT THE MERCY OF THE QUEEN, is Lady Margaret’s story-well, at least the way I imagine it–coming out Jan, 2012. I love all the hidden stories that have been passed down in families. Maybe that’s where a lot of the real history can be found, who knows? Always found Margaret a compelling character. She and Henry did not get along that well, probably as they were too much alike. I really need to read up on this remarkable Princess, and Queen. I had no idea how involved her life was. Thank you Claire. Amazing! I love English History! I wish I descended from Margaret Tudor 🙂 This was a very interesting article to read and Margaret Tudor sounds like a very interesting lady of her time. The Carthusian Priory of St John in Perth was destroyed during the Scottish Reformation which began in 1560. Sadly, Margaret’s tomb was destroyed along with the priory. Another unfortunate tragedy of the Tudor era. I would assume that she did meet and spend time with her brother during that period, although I can’t find record of an actual meeting between them. and lots more! Wolsey seems to have been her contact but I’m sure that Henry would have seen her at court during her stay. Fantastic. There is so much information there. You’re right though. I bet that if Wolsey was in such close contact with Margaret then Henry was right behind! Poor Margaret! From what I read about her she didn’t have a an easy life in Scotland. When she came to Scotland to marry James IV she had to accept that he was unfaithful and had to accept his many illiegitamite children, when she married Archibald Douglas for love she was forced to give up her son the little King James V. After being in England for a year trying to get her brother to help gain custody of James she went back to Scotland only to find her husband living with another women and living off her money and when she married for the third time her was just the same living with other women and spending her money she must have been heartbroken to be betrayed time and again by her husbands. A lot of women, in those days, fought fire, with fire, and took on lovers of their own. I don’t mean any disrespect but, if I couldn’t seem to be able to obtain a husband who would be faithful to me, then I’d probably find myself straying else where. Who knows? Perhaps Margaret did this. I just can’t see someone sitting around, pining away for a mate who, they know is being unfaithful. What a waste! Better to be able to look back on your life with fond memories. But, I know. . .I’m thinking like someone who was raised in our generation and time, not theirs. On ancestry, my maiden name is McDaniel, and am told they were something else. Didn’t believe in divorce. Amazing that Henry VIII changed his mind with the prevailing wind. I have less and less sympath for him and his predicament the more I read. Henry got what Henry wanted and God help anyone who stood in his way. Horrible man. I really enjoyed reading your article. Margaret’s life seemed very hard and loveless. And then in the end to have her resting place and body destroyed, how tragic. The Carthusian Priory of St John was destroyed but I can’t imagine Margaret’s tomb would have been desecrated at that time. Perhaps like those of Richard III her remains will one day be discovered. The eldest daughter of Henry VII and Elizabeth of York, she was married to James IV of Scotland in August, 1503. After the death of James IV, she married two more times: Archibald Douglas, 6th Earl of Angus in 1514 and Henry Stewart, 1st Lord Methven in 1528. Margaret died at Methven Castle on 18 October 1541. She was buried at the nearby Carthusian Priory of Perth. Her tomb was destroyed and her remains were burned on 11 May 1559 when a mob of Calvinists attacked the Priory. Well I come from Adam and Eve…. I love reading true stories special about royalty. One thing that aggravates me is all of the senseless killing that was done for power. Also it would have been nice if they didn’t name their children after themselves for it gets confusing trying to keep up with who is who. Amazing! She is my 17th great-grandmother through my 17th great grandfather James IV). So it turns out my 23rd great grandfather is Robert the Bruce. I came to discover this AFTER I had an obsession with the stewarts, tudors and so on. I actually chose to do an essay in college about the movie “The Other Boelyn Girl” before I knew that I had any connection to them! The facts are intriguing….better than the movie. Margaret Tudor is my 12th great-grandmother which makes her brother King Henry the 8th my 12th great-uncle. Seeing more facts really show the realities of history. I did my ancestry and am a descendant of William the Conqueror and Isabella of Angouleme and her second husband Hugh x of Lusignan. It is a little overwhelming that your ancestors were great influences of history. How do you manage to trace your family back so far? What sources do yo use. Hi Deb, we are all related to royalty in one way or another, not many records of surnames written down, but I can get as far as 1600, really need to pay to research further. I don’t think that’s quite true, whilst we all have bloodlines going back to antiquity we cannot say in all certainty we are related, after all we possess different DNA which we only share with our close blood relations, and whilst many thousands of years ago in different communities there possibly was a lot of inter marrying, there not being as much population as now, I believe the great time span between then and now, and after all I’m talking about pre history cancels out any closeness in the people alive today, only if you actually have on record your ancestors can you claim them as your blood kin, anyone can say their related to someone, it’s proving it that’s the difficult part. I thought she married Charles Brandon as well. I wrong? I studied history in college. Her sister, Mary Tudor, was married to Charles Brandon, Duke of Suffolk. So, I’m thinking this puts her date of death on November 24 or 25, not October 18. What are your thoughts? I wasn’t sure where your information came from. I’m not saying this book is correct, I just wanted to address the inconsistency. “Reports that, as commanded, he has been in Scotland to inquire of the death of the Queen, and whether she died intestate. She took a palsy upon the Friday before night, at Meffen, and died on the Tuesday following before night, but, as she doubted no danger of death, omitted to make her will until past remembrance for that purpose. She sent to Falkland for the King, her son, who came not till after she was departed. Seeing death approach, she desired the Friars, her confessors, on their knees, to beseech the King to be gracious to the earl of Angus, and asked God mercy that she had so offended the Earl. She also asked that lady Margaret Douglas, her daughter, might have her goods. The same day, after her decease, the King came to Mephen and commanded Oliver Sinkler and John Tenant, of his Privy Chamber, to lock up her goods to his use. She left in money but 2,500 mks. Scots. Signed: By me, Barweck Porsovant. The editor’s note is that the date of her death was Tuesday 18th October 1541. You can read the full letter in State Papers V. 194 – see https://archive.org/stream/statepapers05grea#page/192/mode/2up. I’m assuming that historians have put together Henry Ray’s letter along with James being recorded as going to Methven and his instructions to Margaret’s privy chamber, I really don’t know. Interestingly, Strickland dates Margaret’s death to November 1541, basing it on Ray’s letter in State Papers, the footnote saying “State Papers, vol. v. Nov. 1541” but State Papers does not date the letter. I agree with her regarding 1541, not 1540, but all modern historians date her death to the October. Strickland is brilliant in so many ways, but she did make mistakes. Thanks for sending that link! Interestingly, the footnote at the bottom of page 193 of the state papers that you sent states “the diurnal states that Queen Margaret died on 24th of November and was buried in St. Johnston”. I guess it’s easy to get things wrong when there are different accounts of the same occurrence!! Either way, it’s an interesting read! I adore Agnes Strickland. It’s hard work for me researching Tudor history today and I live in a world where archives can be visited, there are courses on how to read medieval/Tudor handwriting, a multitude of documents have been transcribed and digitised, there are lots of well-referenced books out there and historians can be reached by email…. so Strickland did an incredible job researching and writing her books in a world without all that. I applaud her. Did Margaret Tudor die from a stroke, or cerebral palsy ? I read stroke in some sites, other sites, cerebral palsy, which is correct?? I’m pretty sure I’m a descendent of her. After researching my family tree last year, I’m fairly certain that I’m a direct descendent of Lady Mary Tudor, illegitimate daughter of Charles II and Moll Davis…who Charles is, of course, a direct descendent of Margaret Tudor.